The crew of the exploration ship Znutar just wanted to cruise around the galaxy, discovering strange new worlds and playing pool. But then their ship was invaded by the Awful Green Things. And suddenly they were fighting for their lives. In this wacky two-player game, one person takes the part of the Awful Green Things. Every turn the monsters multiply and grow . . . especially if they can gobble up a crew member! The other player commands the crew, frantically trying weapon after weapon in hope of finding something to defeat . . . 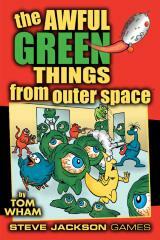 The Awful Green Things from Outer Space. This new edition of the classic science-fiction game includes 151 color counters (and a ziplock bag to hold them), big full-color gameboard, five GREEN dice, and the rulebook. And now you can take the battle to space! "Outside the Znutar" gives new rules and counters for fighting on the surface of the ship. Length of play: 1 to 1 1/2 hours.